The first time we went to Boracay back in 2004 we didn't have so much money (well, actually I don't have so much more now) so we took the Superferry instead of a plane. I have to admit that I was a bit apprehensive in the beginning but the trip turned out to be quite pleasant. 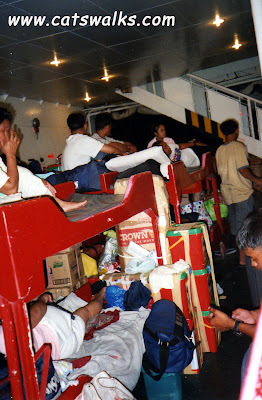 We stayed in the economy class without aircon on the uppermost deck of the ship. I am claustrophobic, I hate airconditioning and I was consumed by a morbid thought that it would be easier to swim away if I stayed on the upperdeck than if I would be in the rooms below in case the ship sinks, so being on the upperdeck seemed like the best idea. Anyway, the sea breeze was so fresh I didn't see a need for airconditioning. My only problem with this trip is sharing the toilet with hundreds of people, but in fairness the crew kept it reasonably clean. I had a great time observing the other people in the ship which was very easy considering that the bunkbeds are so close together. The ship left Manila Saturday evening then in the early morning of Sunday, for 800 php one way, we were in Aklan! 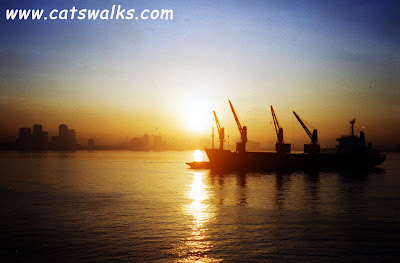 The best part of taking the ship is to wake up to the view of Manila Bay during sunrise (One needs to admit that the pollution is contributing positively to the drama of the picture below). I would do it again for sure if I have more time. Actually, we thought of taking the superferry again to go to Coron in March but the schedule did not match ours, so we will fly with Asian Spirit instead since they are more flexible. I wish i could go to boracay too. For me superferry is better than negros navigation in terms of foods and facilities. I have never taken Negros Navigation. So, thanks for sharing your thoughts!